After working on conventional farms in North Central Washington for 8 years, Jeff and I realized – first hand – the effects of harsh chemicals and unsustainable practices. We loved farming, but we needed to farm in an environment that was both healthy for us, our future children, and the food we were growing. We felt the only option was to go organic. 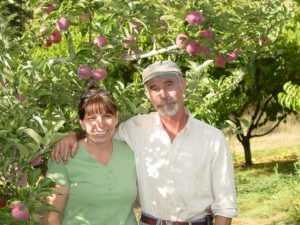 In 1982, Jeff and I moved to Eastern Washington and planted Cliffside Orchard on 7 acres of untouched land above Lake Roosevelt using exclusively organic practices. Since then, we’ve grown the orchard to over 1000 trees consisting of a wide variety of different types of fruit. Our orchard is nestled against a hillside at 1600 feet elevation which offers protection against the harsh climate of Eastern Washington. Since the orchard’s inception, we have maintained the use of organic practices in order to produce a healthy, safe, tree ripened, and nutritious product that tastes great. We were one of the first certified farms in Washington (grower #30) and are certified organic with the WSDA. We believe that healthy trees and soil deters potential diseases and pests, while at the same time producing a superior tasting fruit. If you’re interested in a tour of the farm, we are located 10 miles south of Kettle Falls (80 miles north of Spokane and 40 miles south of the Canadian border), so stop on by.